Like this? You can subscribe to my Dream.Learn.Make channel here to make sure you don’t miss any videos. Use Adobe Reader to view/print, not Mac Preview, your internet browser or the version of Adobe Reader that comes with Windows. You can download Adobe Reader for free here. Print the page with the test square and measure carefully before printing the whole pattern. THIS IS IMPORTANT. If the square is 1/8″ (3mm) off and it’s a 2″ square (which is what I use) that means a pattern piece that is 8 inches long will suddenly be 1/2″ (12mm) longer or shorter – and that can be a whole size different! Longer/wider pattern pieces will be off even more. Use Mac Preview, your internet browser or the Adobe Reader that comes with Windows 8 to print. I have personally printed from Mac Preview and seen every page be off by a different amount! And if you click print straight from the internet browser or your email, you may even end up with missing lines or that aren’t on the actual pattern. Always download the pattern, then open in Adobe Reader. Assume that because you used the same settings as you used another time the pattern is correct. ALWAYS MEASURE THE TEST SQUARE. Once you’ve printed, you can use scissors, or a rotary cutter to cut off tile edges. I cut off two edges only, then overlap the tiles and tape on the size line I’m going to cut. 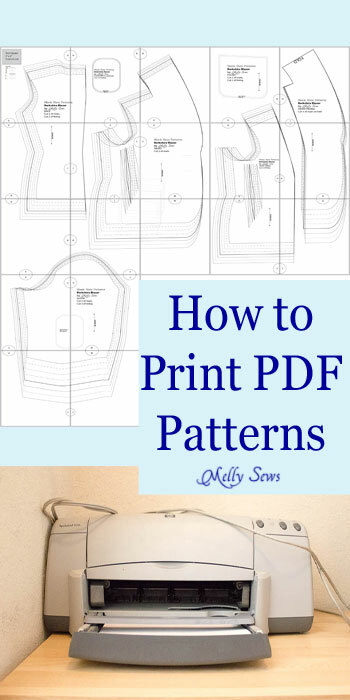 Hopefully these tips will help you with PDF printing frustration and help with getting a perfect fitting garment from the pattern. And if you’re ready to get started with PDF patterns, check out the kids and women’s clothing pattern in my shop, Blank Slate Patterns. I’m in the UK, and I find that a lot of size issues are resolved by my selecting the correct paper size that the pattern is distributed in rather than the paper I use. So for example for US patterns, if I select US letter size paper rather than A4 and no scaling it prints perfectly, even printing it on A4. Of course sometimes patterns go right up against the edges and then they can get chopped off, but they’re always the right size! It’s rare to come across a pattern that has edges chopped off for me. I think the same for patterns that I write which are on A4, if US buyers choose the correct paper size then it prints out perfectly to scale. This is particularly helpful when using Windows 8 which has taken a lot of options away!! I am making a top using a printed PDF pattern and it’s coming out about a size too small. Guess why? Because I decided that small difference in the test square wasn’t worth reprinting to correct. Ha!! So I had to laugh at myself when I saw that in your post!! I forgot to add – the post is scheduled to be published in a couple of hours. I love being able to get patterns instantly. I just hate putting all the pieces together. What a pain in the neck plus the cost of paper and ink. I have never had an issue with printing on windows 7 but now I’ve switched to a macbook so I may run into issues there. Either way, thank you for this tutorial!! Also, I disagree with PDF patterns being a hassle and expensive. I use EVERY size in the pattern. So for me, its extremely helpful to be able to print unlimited patterns and cut one for each size. Putting them together is a piece of cake compared to cutting tissue patterns down to size and then you would nearly have to purchase one for each size if you wanted to cut them down to a certain size. I personally fold the edges but thats neither here nor there. Is there a way to take a patteren and make it bigger if the pattern size is to small or big for a person? like a sizw 6 patteren that I can turn into a size 8? Can it be down by scaling the. Pattern up or down? I am also in the UK and I’m using Foxit Reader instead of Adobe. This has been reliable so far and with no scaling and paper set to A4 I haven’t had any problems with printing. I agree that multi size digital patterns are good value especially if you use more than one size and can cut them to size each time. Wow that was quit the letter I received, all though I enjoy a free pattern now and then, I also enjoy reading, I don’t always respond to what I read but I usually read it if it has caught my attention, so when I received your letter I was very surprised. May GOD bless you always. New to sewing and love the concept of printing patterns NOW plus you can save and go back to them. Thank you so much for these tips cause I would have just printed and given no thought to sizing. Awesome!